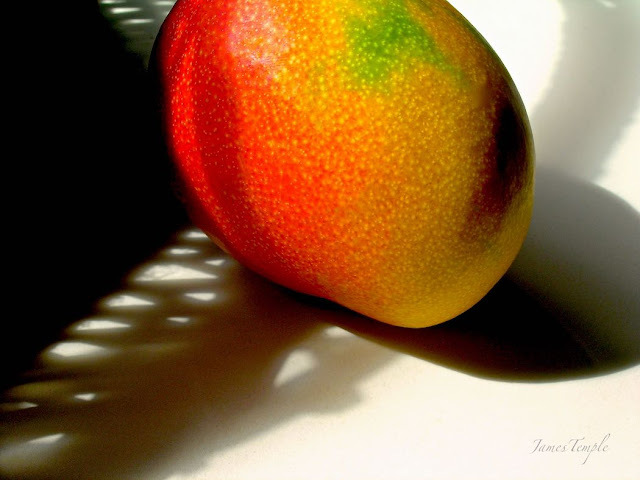 Tasting Hawai'i With Moloka'i Chef James Temple: It's June... Mango Season In Hawaii! It's June... Mango Season In Hawaii! June is the beginning of mango season here in Hawaii. What better way to celebrate than to prepare a shrimp recipe where mango is the star. 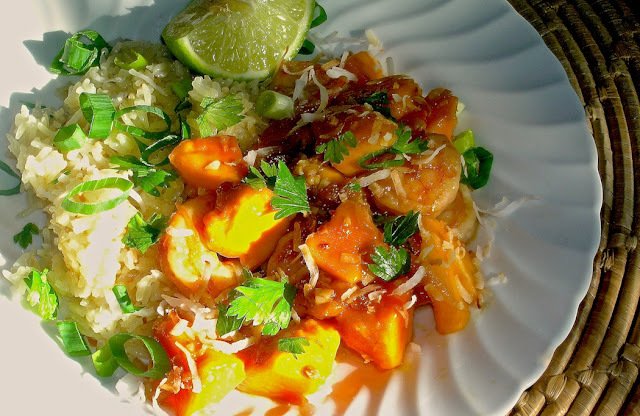 I love this recipe because it allows the sweet juices of mango to mingle with locally grown large shrimp, coconut, and fresh lime juice for a sweet taste of the tropics. In a large dry skillet over medium heat, toss coconut until just toasted. Remove coconut to a small bowl. In the same skillet, heat up oil over medium heat. Add red onion and sauté, until softened, about 3 minutes. Add garlic, soy sauce, fish sauce, lime juice, chili oil, and stir. Add shrimp and toss to combine, about 3 minutes until the shrimp are pink and cooked. Now stir in the mango chunks, until warmed and juices release. Serve over a bed or hot toasted jasmine rice, sprinkled with toasted coconut, and green onions. Squeeze lime just prior to serving. Heat oil in a medium saucepan over medium-high. Add shallots; sauté 3 minutes. Add rice; cook 2 minutes, stirring to coat. Add stock, salt, pepper, and bay leaf to pan with rice; bring to a boil. Reduce heat; cover, and simmer 16 minutes or until liquid is absorbed. Remove pan from heat; let stand covered for 5 minutes. Discard bay leaf. Sprinkle with parsley to garnish.